Browsing through the pages of “Bread Alone,” I spotted a recipe for San Francisco Sourdough, and almost did not pay attention to it, thinking that it would involve the authentic starter. Nope. Daniel Leader developed his own recipe for it, coaching a regular starter into a slightly increased level of acidity, resulting in a bread that, according to him, would be very close to the original. Make the poolish the day before you want to bake the bread, by combining all the ingredients in a small bowl and leaving at room temperature for 24 hours, preferably from 74 F to 80 F, covered with plastic wrap. Next day, pour the water at room temperature in the bowl of a KitchenAid, mixer, and add the poolish, breaking it up gently with a wooden spoon, and stirring until dissolved. Add about 1 cup (5 oz) of the total flour and the salt, and stir until combined. Place the dough hook in, keep adding the rest of the flour (you may not need all of it), and knead for about 12 minutes at the second speed of the machine. Remove the dough to a slightly floured surface, knead it by hand a few times, place it in an oiled bowl, cover loosely with plastic wrap, and let it rise for 2.5 hours, with quick cycles of folding after 45 minutes and 1 hour and 30 minutes. After the second folding cycle, leave the dough undisturbed for the final 60 minutes of bulk fermentation. Place the risen dough over a slightly floured surface, and without de-flating it too much, form it into a ball. Let it rise 45 minutes. Shape the dough as a boule or any other shape you prefer, place it in an appropriate container for the final rise, and leave it at room temperature for 1 hour. Bake it in a pre-heated 450 F, with steam, for a total of 45 minutes, decreasing the temperature to 425 F after 10 minutes of baking. If using a cover to create steam, remove the cover after 30 minutes. Let it cool over a rack for a couple of hours before slicing it. Did the bread deliver the promise in the taste department? YES! When I tried a piece all by itself to get the real taste of the crumb, it immediately hit me as VERY similar to a San Francisco sourdough, so if you live hundreds of miles away from the Bay Area and develop a craving for that bread, this recipe will soothe you. A more authentic shape would be a torpedo type loaf, but I have a weakness for round bread, so that’s how I shaped mine. Round, oblong, it doesn’t really matter. It hit the spot. Awesome bread! Oh, I am sure it’s definitely all in the water and their own mixture of yeast/bacteria – but, this was a pretty nice approximation of it, I’ve been using this starter for quite a long time, and never had this sourness in a loaf. Worked quite well… Next time I’ll go for the traditional torpedo shape. Pretty loaf Sally! I have no idea how sour SF sourdough is. Presumably from what you say it is down to the relatively low ratio of flour/water to mature starter in your refreshment as much as anything else. Does it sit for 24 hours before you mix it in to the dough or 12 hours, I always find ‘day’ quite a loose term, simillarly the night before, my night before can be anything up to 12 hours in real terms, but I think most people use it to mean about 7 – 8 hours. Time is the key thing here I’m guessing. What do you think? Joanna you are absolutely right, the timing is key – I will go back and edit the post because it is 24 hours, not simply overnight (which is a very loose term). Wow, look at that bread. It’s literally perfect. You’re an expert Sally. 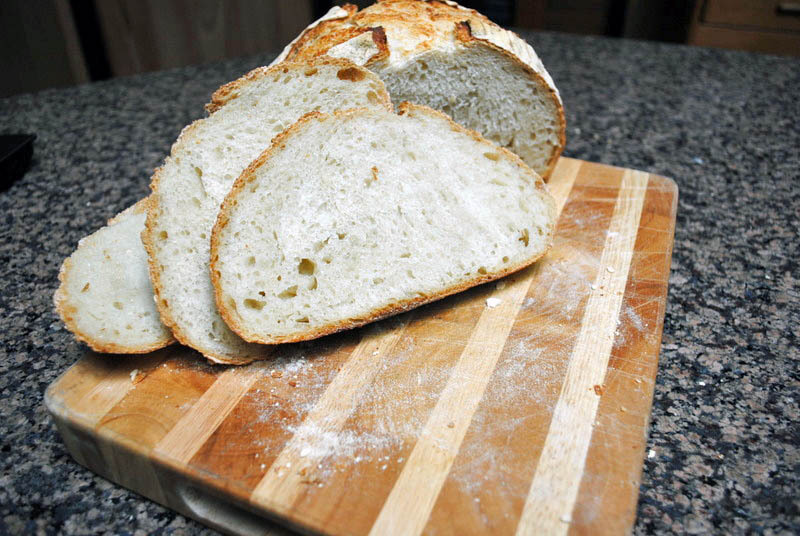 Besides the caveman thing, I fear the process is too scientific for a winger like me – I’m quite certain I would not get your results 🙂 I particularly like the exterior of sourdough – a crunchy, chewy delight. (I also love San Francisco! next to Maine, it is the destination I have visited most in the US). Gorgeous loaf Sally. I loved waking up to this recipe this morning. You know your breads are among my favorites. 🙂 I love SF sourdough. This recipe reminds me of King Arthur’s extra tangy sourdough. Yum! I’ve temporarily given up on making bread though. I’m just having a devil of a time with it. I do miss the smell of fresh bread around here though. Looks simply incredible. There’s just something about a sourdough. oooh…gorgeous loaf of bread!! I think I could smell it while reading this post!! Long ago I made a sourdough bread when I received a starter from a cooking class. I’m definitely going to try this out next time I have a day in the kitchen! será que um dia ainda farei um pão assim? o vapor me assusta, ainda não estou confortavel em assar com vapor. estou com um metodo alternativo para tentar no futuro, se funcionar eu te mando um email, ok? I’ve never used a special bread flour either, but now I’m curious about them! This sounds like a fabulous bread, and I like the round shape too. I’ve bought a few bags of special flours when I was testing recipes for a bread book, and part of the deal was to stick to the flours they used. It was a big hassle, and unless the recipe is for something that requires a very high level of gluten, I now keep it simple. Awesome sourdough loaf! Round is just fine with me. Sally, I want to try this recipe. My concern, before I begin, is that in 24 hours my starter will rise, ripe, overripe and colapse. Usually, at a ratio of 1:1:1 it gets fully ripe in 4 hours at 25C. What do you advise me to do? Go with the recipe as it is, shorten poolish time, or modify the ratio of poolish (1:5:5, for example). Thanx a lot! this bread had hounded me from the minute you posted about it! I’ll wait your answer before I’ll begin. 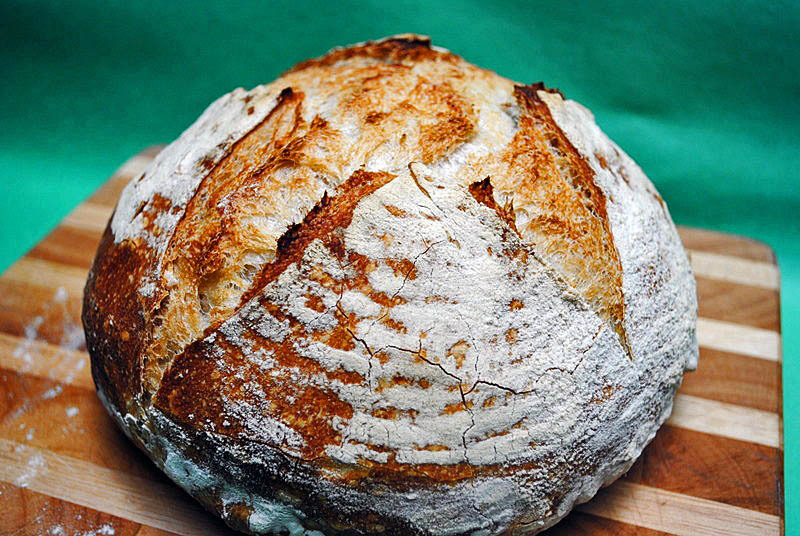 Pingback: San Francisco Sourdough with a twist (I) | Apa. Faina. Sare. I started this before reading through all the comments. I allowed my starter to rise for about 26 hours (I’m awful when it comes to timing these things). It had definitely collapsed by the time I mixed it into the dough. However, though I was a little worried about what might have been sluggish rising during the fermentation, during the final proofing it rose beautifully and my crumb (see description below) was light and airy. It’s a wet dough and I don’t have a stand mixer, so I kneaded for probably 20 minutes to build up the gluten. I’m trying to work on my kneading and my feel for the dough, so it was a pleasure. Now, the loaf is ugly mostly because the crust is disappointingly soft (this is my first soft loaf – per your comments on my last comment, I really need to work on the steam), but the crumb is my best yet! There are tons of beautiful, uneven air pockets. And the flavor is really nice. Thanks again for a lovely recipe! Great that you got a nice crumb, uneven holes is what everybody loves! The “technical term” I guess would be “oven spring” – and probably the most important part of getting a great oven spring is creating structure in the dough by proper folding and creating “surface tension” when you do the final shaping. The surface tension comes from sort of “stretching” the surface of the dough as you shape, and the only way to get there is watching the many youtubes around showing real pros doing it, and then: practice, practice, practice. anyway, deciding to do it is the first step, and I really want to get there, my baguette shaping is pathetic. I’ve continued using this recipe as my go-to practice recipe. My kneading technique is more efficient (particularly after I realized I was breaking the gluten strands I was trying to develop), I have a much better “feel” for the dough, the flavor of my breads better developed (after I switched to daily starter feedings), my shaping…improving, but still no/little oven spring. I think my poor shaping technique definitely has something to do with it (thanks so much for explaining that to me! ), however I chanced upon a wonderful old cast iron dutch oven in an army surplus store on a recent New Mexico camping trip and used it to bake up a loaf immediately after returning home. I cannot express my glee upon removing the lid after 15 minutes. Beautiful, buttery crust and amazing uplift. I’m really surprised it would make such a difference. This doesn’t excuse me from continuing to improve my shaping technique, but at least I can enjoy better bread in the meantime. Thanks again for your lovely recipes, thorough commentary, and very thoughtful comments/responses! Your comment gave me a huge smile, of course… I remember too well the first time I had a nice bread, and like you, I could not believe when I opened the oven and uncovered the bread… that amazing beauty finally there! Thank you for sharing this recipe. I made it yesterday and it was fantastic. My most successful sourdough to date. I will be making this again and again. I just found your blog and I love it!! I’m going to try this recipe right now. I recently had surgery on my shoulder and decided since I was going to have a lot of down time I would try my hand at a wild yeast starter. I got directions from Peter Reinhart on making a whole wheat wild starter and it worked wonderfully. My only problem is I travel for a living so I can’t feed my starter twice a day like you. Do you have any recommendations on what I can do to keep my starter going? Also you mentioned that you have two starters. What two do you have? Welcome to the Bewitching Kitchen! I don’t feed my starter twice each day, I might do that ONLY on the day before baking, because even though I don’t travel for a living, my life is plenty busy and if I had to feed a starter twice a day I might just give up baking bread! 😉 I actually now refresh my starter from frozen, I make a firm starter, maybe 75% hydration, and once it’s done bubbling I form into small balls and freeze them individually on a tray. Four days before baking I remove one ball from the freezer, dissolve in water and refresh it with flour at the desired hydration level. I refresh once a day, maybe the day before baking I do it twice. It’s been working, before doing that I kept the starter in the fridge, but I had problems, the poor thing was in horrible shape, could not leaven bread to save its own life… 🙂 Don’t tell anyone, but now I have only one starter, my own. I allowed the commercial one to die a peaceful death. I could not justify the trouble of keeping two going… It was from King Arthur, by the way. Can you use a Dutch oven to get the crusty outside? I think it could eork quite well! Let me know if you try it, ok?